A new school or work year means a chance to purchase brand new supplies. Are you the type of person that has to put your creative stamp on everything? Notebooks just might be your next obsession. Notebooks provide an easy way to create custom, personalized supplies for the new year. The following 26 various ways to decorate a notebook are fun, creative and an easy chance for you to try your hands at DIY. This simple DIY dresses up an ordinary notebook with any fabric of your choice. Customize with a bold pattern or something a little more subtle that still reflects your personality. Washi tape and paper crafting just seem to go together. Attach strips of colored tape in rows onto the notebook cover, and you will have a journal that is pretty and also one of a kind. Wrap matching washi tape around pencils to coordinate with your notebook. Making a strong design statement has never been easier! Cover a cheap notebook with some pretty wood toned self-adhesive vinyl. Theses notebooks almost look like the real wood from far away. Make some for yourself and some for your friends. They will cherish these cute and trendy notebook gifts. Dyan Reaveley covers notebooks with her fabulous painted designs. If you are artistic and love art why not get inspired by this DIY and paint some beautiful notebook covers with your creations? Experienced painters can use acrylic paints or watercolors to produce notebook covers that are real pieces of art. No one will have another notebook like yours. Decorate your notebook with some DIY washi tape stickers. It is not as hard as you might think! Washi tape resembles masking tape but is superior. It has beautiful designs printed on it and is quite strong. Washi tape has many craft uses and should be part of your crafter's toolbox. Crystal from Hello Creative Family has a tutorial that teaches you how to design your stickers for pennies. Never buy store bought stickers and labels for your projects again. Decorate an ordinary composition book with cute leftover paper scraps and ribbon. Add some pens to the layout, and you will be prepared for class! You just have to paste some coordinating scrapbook paper onto the cover and construct a pen holder with a glued ribbon. The notebook is now practical as well as pretty. Zentangle or doodle art is easy enough for beginners to accomplish. Zentangle is the art of drawing repetitive designs with a black thin lined Micron marker. It takes a bit of practice until you master the steps, but even the artistically challenged can produce lovely drawings following some simple guidelines. This notebook cover inspiration features rows of doodle art, stamped feather clip art, a matching flower and strips of paper in turquoise and blue shades. Protect your notebooks with a vinyl cover and embellish it with embroidered flowers. What an artistic and unique way to apply your needlework skills. These small covered notebooks are the perfect size to tuck into your purse. The tutorial provides a free printable template. Print the notebook cover template onto heavy-duty brown cardstock, and cut it out. Wrap the cover around a 3.25-inch x 4.5-inch composition book and then decorate the spine. 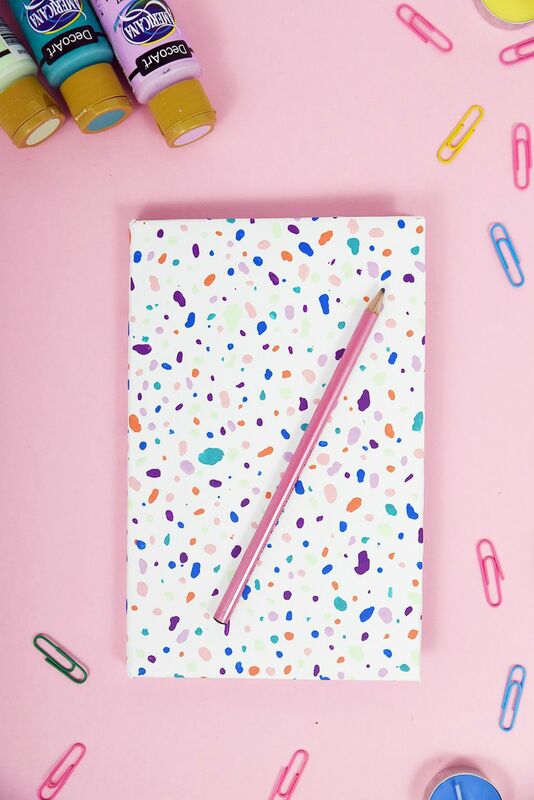 Such a pretty journal to jot down your thoughts on the go! Make a notebook that is in the shape of a Monarch butterfly. Butterfly notepads are a craft that your kids will want to help you make. They are so beautiful that you and your children will surely want to craft several to give to your friends as gifts. Letter notebooks are a smart way to make a special present for your friends. They will think of you fondly every time they write something on the notepad. Terrazzo is a material that is used to make floors and walls. The compound has chips of marble, quartz, glass or granite which give it its beautiful, distinctive pattern. This notebook cover mimics that design, which people have loved since the 15th century. Good design always stands the test of time. These cute little notebooks are just the right size to pop into your purse. All you need are stickers, a stapler, and some colorful paper to make these sweet little books. This notebook cover was originally designed as a Valentine's day gift, but it could work for other occasions also. Make it as a favor for your next bridal or baby shower. Your guests will love it! Mini-notebooks cost only 97 cents apiece. Make them unique with chalk paint and a chalk marker. Attach some leather strips to the spine, and they look like they came from an upscale gift store. Aren't these heart-shaped notebook covers just the cutest thing you have ever seen? Cut a heart shaped hole into the notebook cover and glue your favorite paper design to the backside. Add some handmade stitching to the perimeter of the heart, and you are finished. How lovely! Who says school notebooks have to be dull and boring? Label each subject with gold glitter lettering, and attach gold glitter paper to the spine for a glamorous new notebook. These notebooks have simple black vinyl lettering against a white background–proof that the design principle "less is more" is pure elegance. Sometimes we just want to label our notebooks rather than cover the front with decorations. Learn how to make and attach a simple leather tag to a moleskin notebook. This project is so chic; you will want to make extra as gifts or to sell at a craft fair. Do you have small children in your home? Make them some house shaped altered book notebooks. Cut a notebook at an angle to mimic a roofline, then glue on small wooden shingles, kraft papers and scrapbook tiles to finish the house shaped notebook cover. The books are just adorable, and will quickly become your child's favorite! Adults will love these cute notebooks too. Make this beautiful notebook cover from kraft paper and woodgrain stamps. It was initially designed as a Valentine's Day gift, but certainly could be used year round. Just change out the red glitter heart with some other type of sticker suitable for the season. What a pretty and original notebook cover treatment. Protect your notebook with a leather cover. The tutorial demonstrates just how easy it is to make a sturdy protective cover—it's just a matter of cutting a square of leather and wrapping it around a notebook. So easy, elegant and fun! Kids love to cover their school notebooks with stickers. Download and make these cute summer themed stickers for free! The files are laid out to print on Avery stickers you can buy at your local office supply store. The labels are so much more beautiful than the pre-printed ones you buy in stores. Add your own unique touch to your back to school supplies. Bright colors and raised gold paper letters will take your plain Jane notebooks to higher levels of design. Are you design challenged but still want to make your school notebooks pretty? Damask Love offers two free printable composition book covers for download. All you have to do is print them out and glue onto the notebook covers. Instant style! It doesn't get any easier than this! Add some interest to your hardcover drawing notebooks with tape and floral paper! It brings a colorful, artistic and feminine touch to your drawing notebooks.